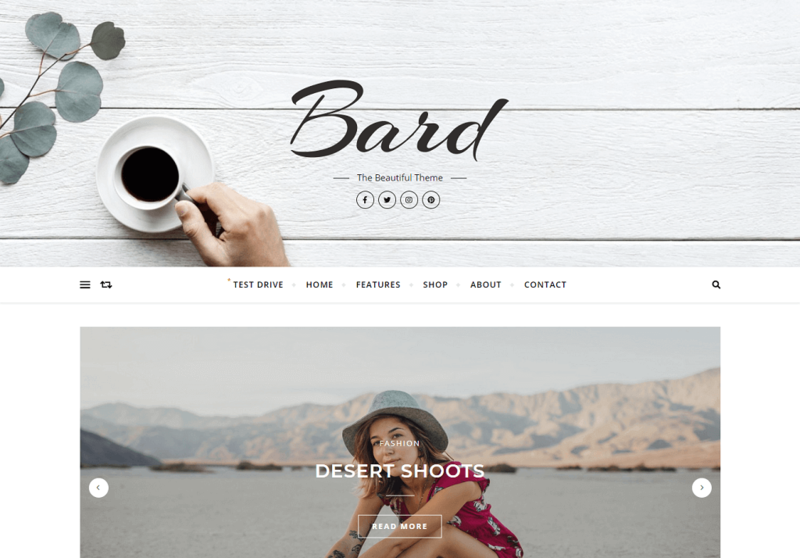 Bard is Beautiful, Personal and Multi-Author Free WordPress Blog Theme. Which will be perfect for personal, lifestyle, health & fitness, food, cooking, bakery, travel, beauty, fashion, wedding, photography, news, quotes blog, auto blog, small business website and any other type of amazing blogs. Bard is minimal, elegant and responsive layout with WooCommerce shop support will WOW and inspire your visitors. Bard is well documented and easy to use even for WordPress beginners. Its clean and modern responsive design will perfectly showcase your content on any device, even on tablet, mobile & retina displays. Bard is provides multiple features like it is very fast, compatibility with many popular plugins and of course translation & RTL (right to left language) ready, coded with best SEO practices. It is also has features like Text & Image logo, Fullscreen Slider, Header image, Instagram slider widget support, footer menu support, GDPR compatibility plugins support and so many more, works perfectly with all major drag and drop page builders like Elementor, Beaver Builder, Visual Composer, SiteOrigin, Divi.